“At present, we are supplying 40 MLD treated water to industries in Pandesara in the city. This is the largest capacity of tertiary water treatment in the country. 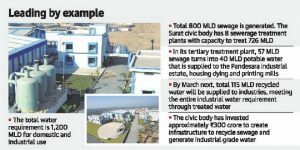 In fact, Surat was the first city in the country to start selling recycled water to industries in 2014. Now, we are expanding the capacity to take it up to 115 MLD by March 2019,” Surat Municipal Commissioner M. Thennarasan told The Hindu. “Gujarat is a water scarce State, so we have to be innovative in managing our water resources in the most efficient manner,” Gujarat’s Chief Secretary Dr. J. N. Singh said. 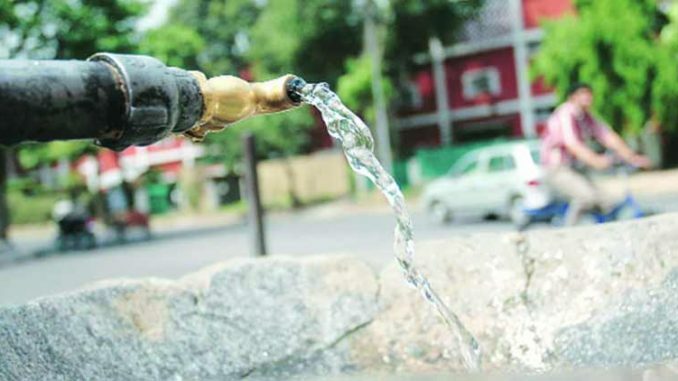 Mr. Thennarasan added that the civic body intends to go further and supply recycled water to industrial clusters like Hazira, outside the city. “In future, we want to cover industrial estates not located in the municipal area in our network as per the State government’s policy,” he said. India is facing its worst water shortage in history, according to a new report prepared by the Niti Aayog. Nearly 600 million Indians faced high to extreme water stress and about 2,00,000 people die every year in the country because of inadequate access to safe water.